Directional Movement Index (DX) is indicator in technical analysis which is based on two other Welles Wilder's indicators: negative directional indicator (DI-) and positive directional indicator (DI+). For directional movement index period (n) is usually used value of 14. If DI+ crosses above DI-, you should go long. If DI- crosses above DI+, you should close position (go short). 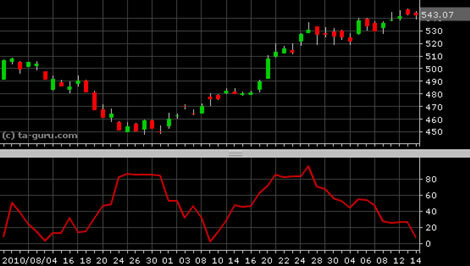 Open chart for google with DMI indicator.